"Le Bouganvillee" is a tourist resort situated in the north-west of Sardinia, in Platamona (province of Sassari), near a 12 kilometres long sandy beach at the centre of the' Gulf of Asinara'. The residence is located in a shady pinewood, at 3 minutes by foot from the sea and a few minutes by car from the centre of Sassari and Porto Torres. The Airport of Alghero can be reached by car in about 25 minutes. 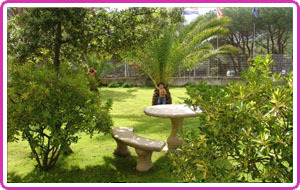 The apartments of "Le Bouganvillee" are available during the whole year. They come in different sizes with one, two or three bedrooms. They all have a sitting room, a kitchenette and a bathroom. The apartments of are comfortable and fully furnished, complete with air conditioning and TV. They are meant for two- up to eight persons. The ground-floor apartments have a small private garden. The first- and second-floor apartments are provided with balconies. The residence is lying in a large enclosed garden with private parking areas and a playground, where you and your children can have fun. There are a washing machine and a dryer available for common use. Linen service, daily cleaning and any other kind of assistance are available on request. Mentioned services are not included in the price. 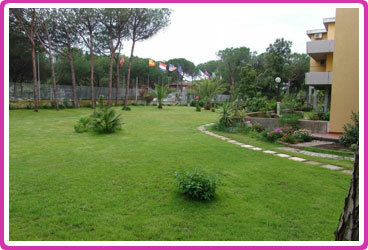 A commercial centre near "le Bouganvillee" offers some sport facilities such as tennis grounds and swimming-pool.